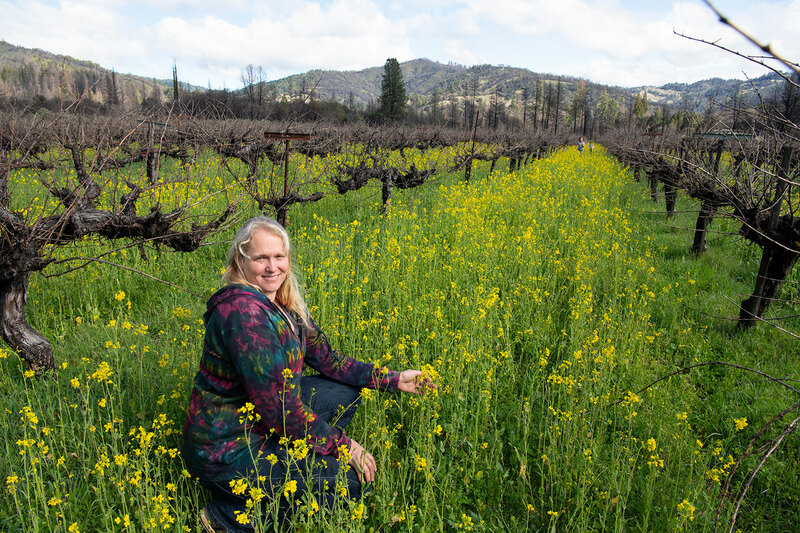 Eliza Frey with wild mustard in Frey biodynamic Cabernet vineyard. 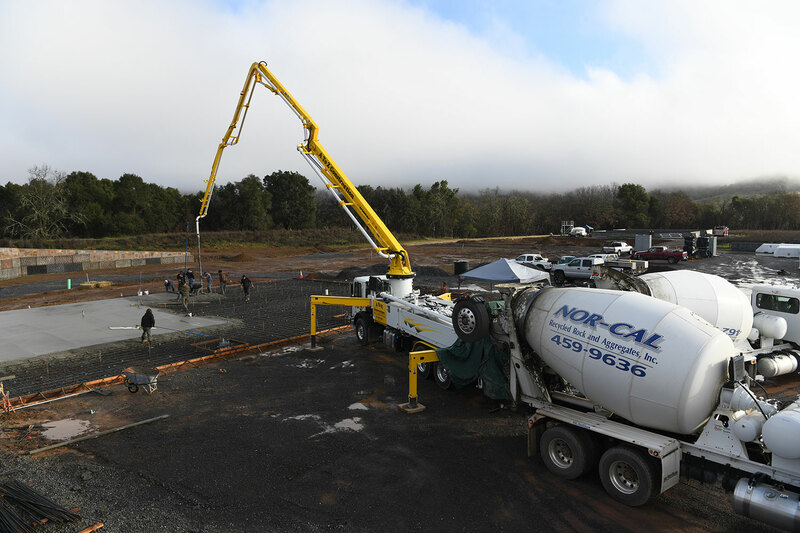 After weeks of rain and the chill of the polar vortexes, spring is arriving in Mendocino County. One of my favorite spring pastimes is taking to the fields and gathering wild spring greens, or edible weeds – a tonic to the body and the spirit. With their beautiful shapes, shades of green and wide array of flavors, they make a wonderful addition to springtime cuisine. Wild edibles spice up any salad or sandwich, add layers of flavor and texture to stir fries, deepen the flavors of soup or provide a unique garnish for any dish. 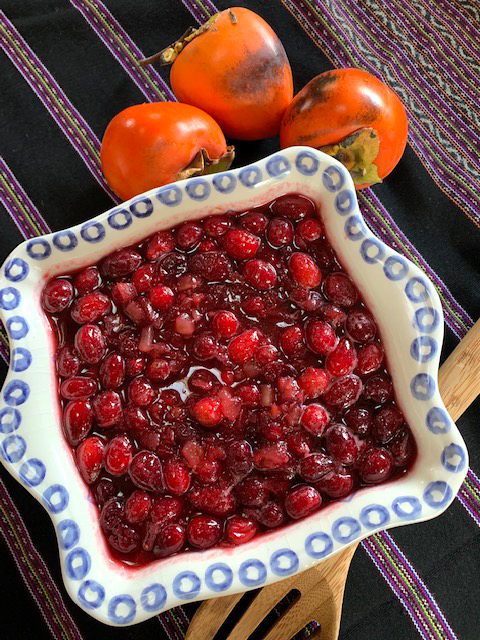 Wild edible plants connect us back to the abundance of Mother Nature, and to our ancestors, who relied on foraging for survival. Wild plants don’t need humans to help them grow, and there is something beautiful and complete about their ability to get what they need and thrive on their own. 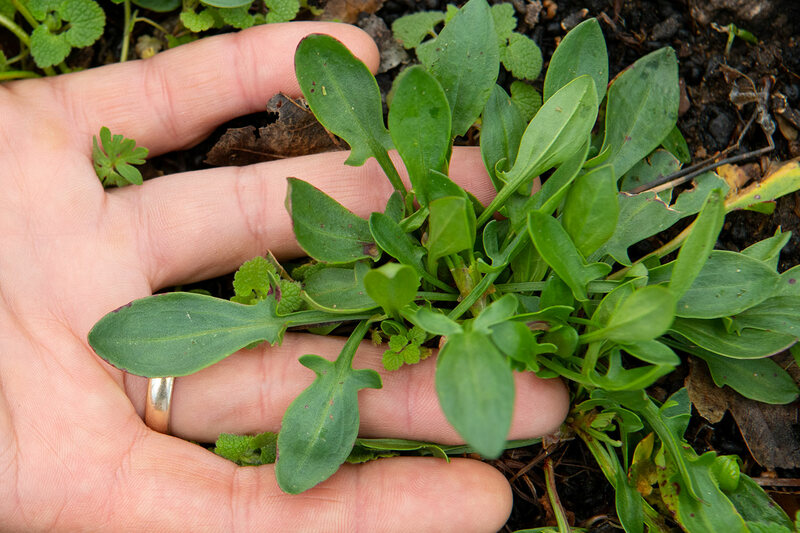 Gathering wild greens is easy and fun as long as you follow some common sense guidelines. Make sure you know what you are eating! Never eat any plant without first knowing that it is edible. Many wild edibles have close look-alikes, so make sure you are well informed before ingesting any new plant. The information below does not include identification details for the listed plants. A great way to make sure you’re being safe is to find a friend or neighbor who is knowledgeable and invite to come forage with you. Local foraging classes and groups are popping up all over the nation. There are countless websites and books about gathering wild plants, and a quick internet search can connect you with plenty of resources. Edible weeds are only healthful when harvested from areas free of chemicals and pollutants. Avoid harvesting from chemically maintained lawns, near motor roadways, non-organic farms or in areas where there may be high dog traffic. After harvesting wild greens, make sure to wash them thoroughly. Never harvest an entire stand of wild plants. A general rule of thumb is to leave at least 2/3 of any given patch untouched, allowing the species to complete its life cycle and reproduce, and ensuring that there is plenty for wildlife. The abundance and variety of wild edibles varies greatly among different climates and regions. While the varieties listed below are available and abundant for Mendocino County, California, in spring, your location will ultimately dictate what you have access to and when. 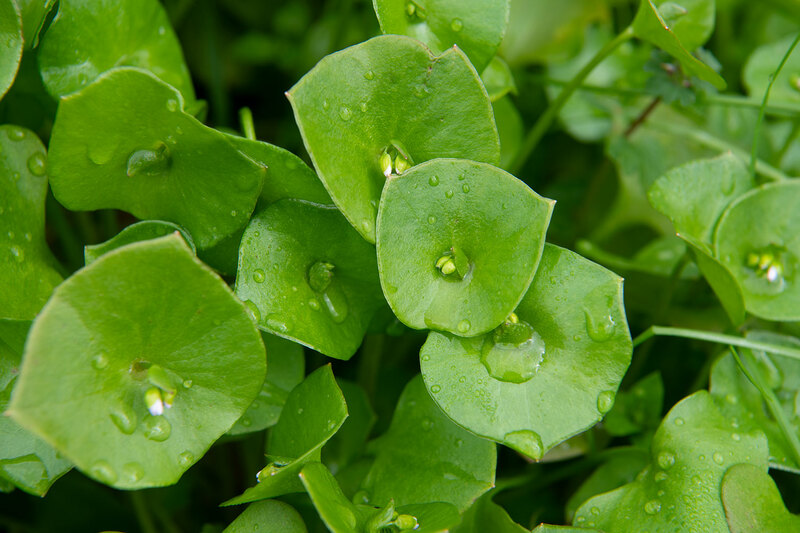 Miner's lettuce, an annual flowering plant, is also known as Indian lettuce, spring beauty, and winter purslane. Native to the west coast of North America, it prefers cool wet areas, and in inland Mendocino County it is available from Late January to April. Fleshy stems lead to rounded rosette leaves that cup the morning dew. White or pink flowers develop on a slender stem that grows out of the center of the leaf. It is abundant at the edges of our vineyards, in shady areas at the forest’s edge. It is best picked when fresh and green, before flowering. The stems are crisp and juicy, and the leaves are tender with a mild watery flavor, well suited as the base of a salad, or used as a substitute for lettuce in any context. Chickweed is a low growing annual that reseeds yearly and emerges in late winter, as rainfall and warmer temperatures allow germination. Its tiny leaves climb wispy mats of stems in semi shaded edge areas and sunny fields. As it matures tiny white flowers form at each leaf node. It has a pleasant, mild flavor and is a great substitute for sprouts on sandwiches and in wraps. It is also lovely in salad. It gets slimy when cooked so try enjoying it raw. For larger, leggy plants, you may want to use only the leaves, as the stems can be a bit fibrous. 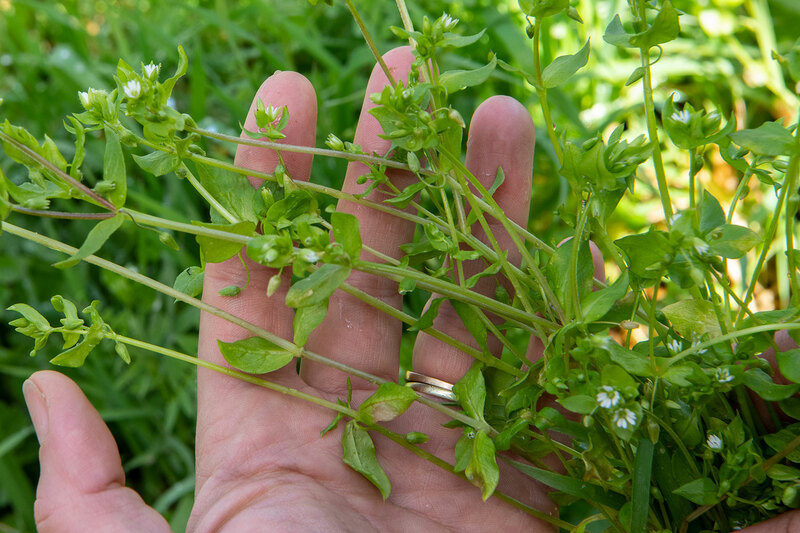 Chickweed doesn’t store well, and is best eaten within a few hours of harvest. This is the most common variety of dandelion, although there are thousands. Dandelion is a perennial plant native to Europe. In California jagged leaves re-sprout from taproots in the late winter. In wetter climates the greens can be harvested throughout the growing season. A thick, fleshy stem develops and forms bright yellow, multi-petaled flowers that eventually turn into globes of fluff that scatter on the wind with our wishes. 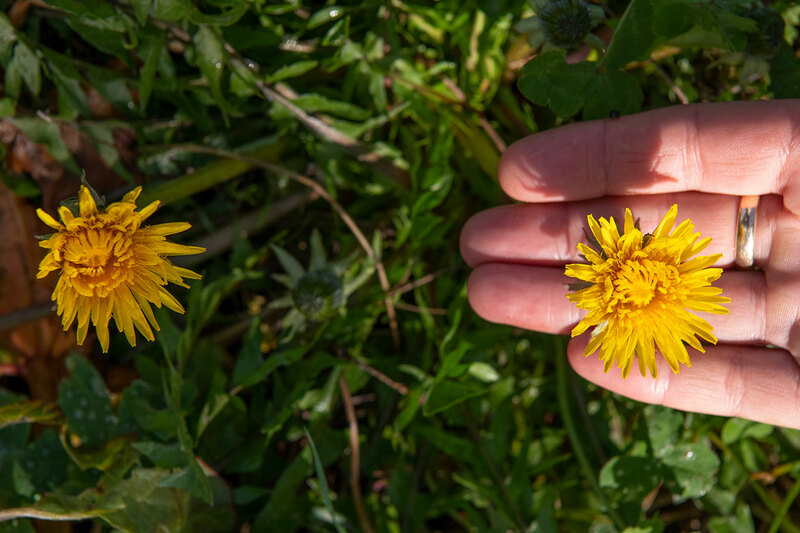 Dandelion’s nutritional value eclipses most of the fruits and vegetables you can buy in the grocery store. It is recognized as a tonic to the liver, kidneys, blood and digestion. Dandelion has an intense bitter flavor that is somewhat of an acquired taste. The entire plant, including the leaves, stems, flowers, and roots, is edible and nutritious, packed with vitamin C, potassium, calcium, iron, magnesium, phosphorus, thiamin, riboflavin, beta-carotene and fiber. Due to their intense flavor, greens are often cooked, and are delicious with a bright lemony dressing. The flowers of dandelion are also beautiful and pungent before they start to form seed heads, great as a garnish or sautéed with garlic. Dried and roasted roots can be ground and brewed as dandelion coffee, and are an ingredient in traditional root beer. Wild Mustard is found all over the world and mustard and its cousins radish and turnip have been grown since ancient times. 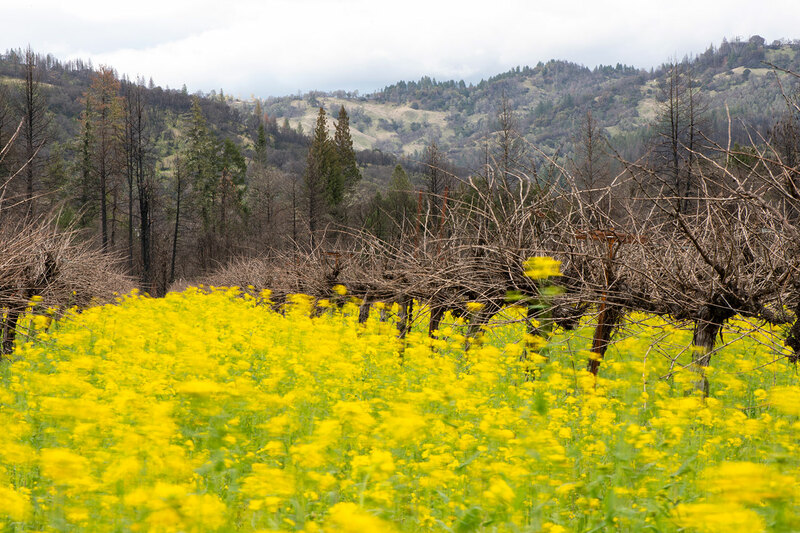 Here in Mendocino County the spring brings an explosion of color as the bright yellow flowers fill the vineyards, delighting bees and foragers alike. Mature plants can be up to 4 feet tall, but they are tastiest when harvested young. 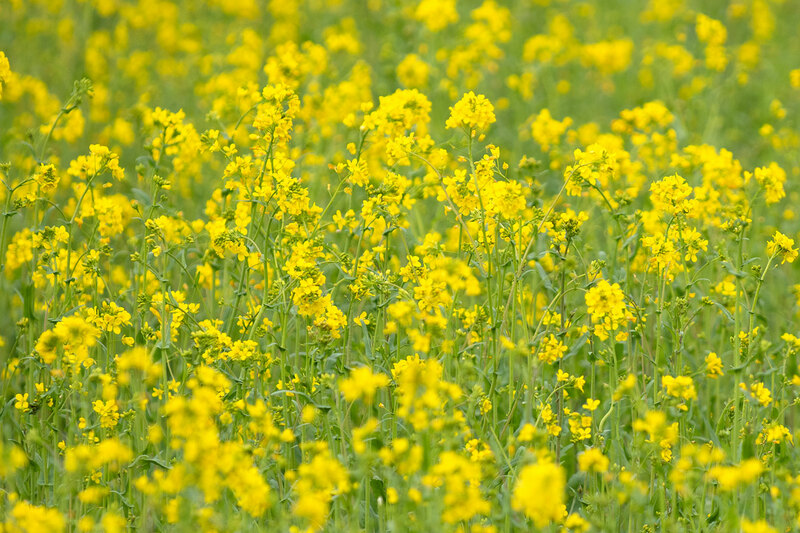 The mustard flower is a beautiful garnish on salads, with a rich pollen-like flavor and gentle heat. The greens need to be harvested young, as they get spiny as the plant reaches maturity. They are a wonderful addition to any stir fry, chopped fresh in potato salad, or served wilted with a vinaigrette dressing. As flowers drop and the plant forms seed-pods, the tender green pods can be harvested and pickled. As the plant finishes its life cycle the mature seeds can be harvested and ground into mustard. 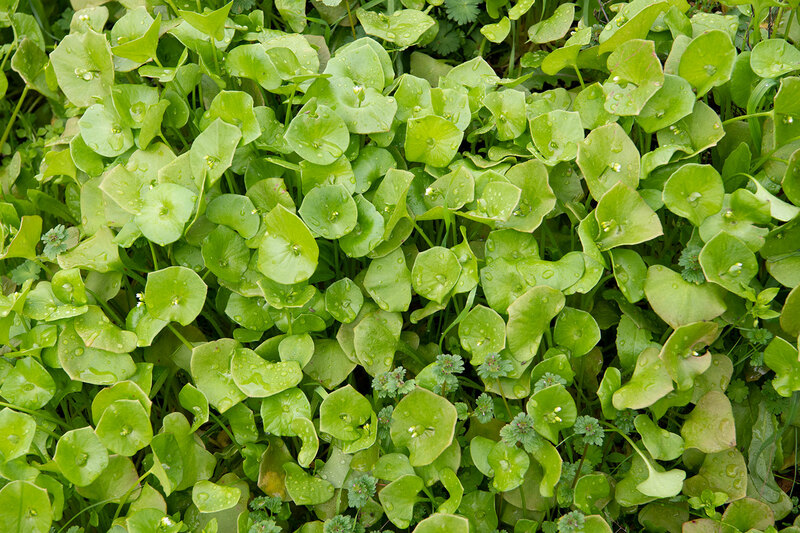 Sheep's sorrel is a low growing perennial herb in the buckwheat family is native to North America. It makes its home in disturbed soils and spreads from seeds and fleshy, horizontal roots. Clumps of green arrow shaped leaves form at the base of the plant, which redden as the plant grows and forms upright flower stalks for tiny reddish-brown flowers and seed pods. Tender green leaves have an intensely tart lemon flavor that is a great accent in salads and soups, and adds pop to pesto. Its seeds are also edible and can be eaten raw or cooked. While winter peas are not wild in our vineyards, they are part of our annual cover crop mix. Peas are legumes that fix nitrogen into the soil. They grow tendrils that help them climb amid ryegrass and bell beans and have fleshy silvery leaves that form in whorls along the rigid stem, and they form beautiful edible pink flowers as temperatures rise. Harvest the top 2-4 inches of the pea shoots to enjoy their distinctly sweet and nutty flavor that is wonderful raw or cooked. Try them sautéed with garlic and olive oil or in place of spinach in your favorite soup. The flowers are tender and mild and gorgeous as a garnish or salad ingredient. Consider adding them to a winter cover crop for a delicious supply of late winter greens! Native plant Societies – connect with your state or local group. 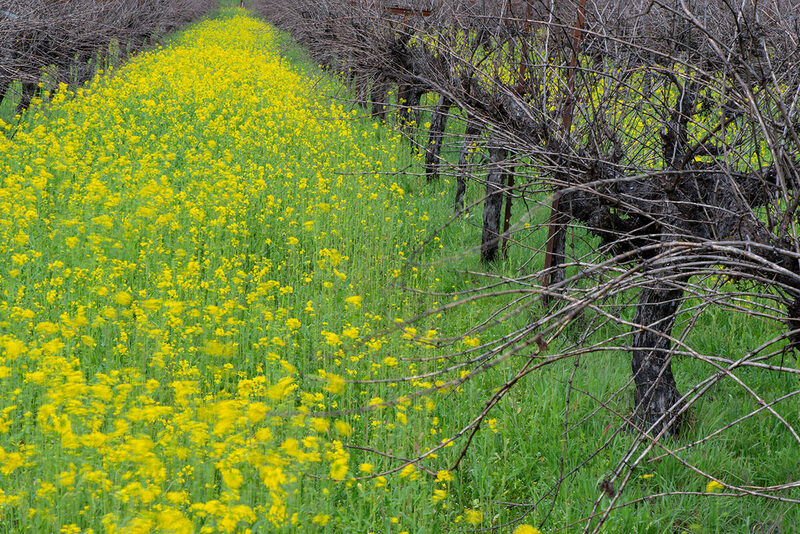 Mustard blowing in the wind in Frey organic Cabernet vineyard, Spring 2019. The season turns and cycles of vineyard work turn with it. 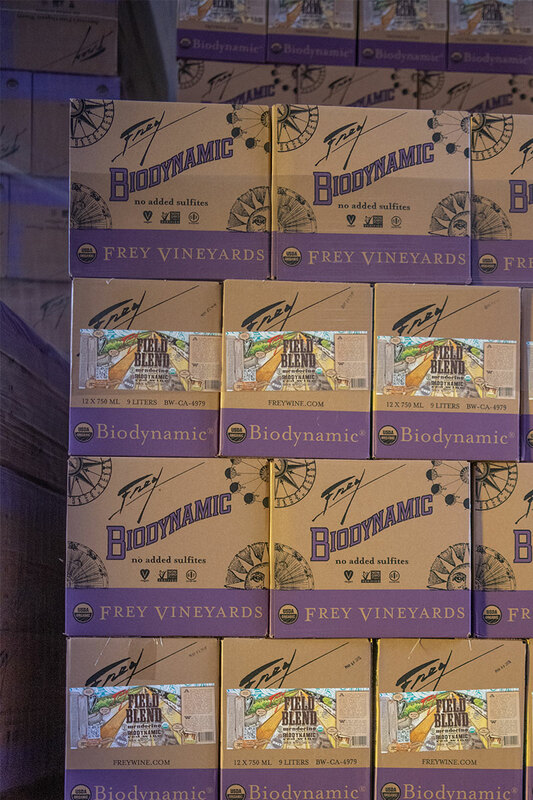 With the release of the first 2018 wines, we are looking ahead to a great 2019 vintage. We will be wrapping up pruning next week. Pruning is arguably the most crucial of all vineyard processes, as choices about which wood to remove or leave determines fruit set this year and into the future. Pruning is also the most time-consuming, labor-intensive task of the year. 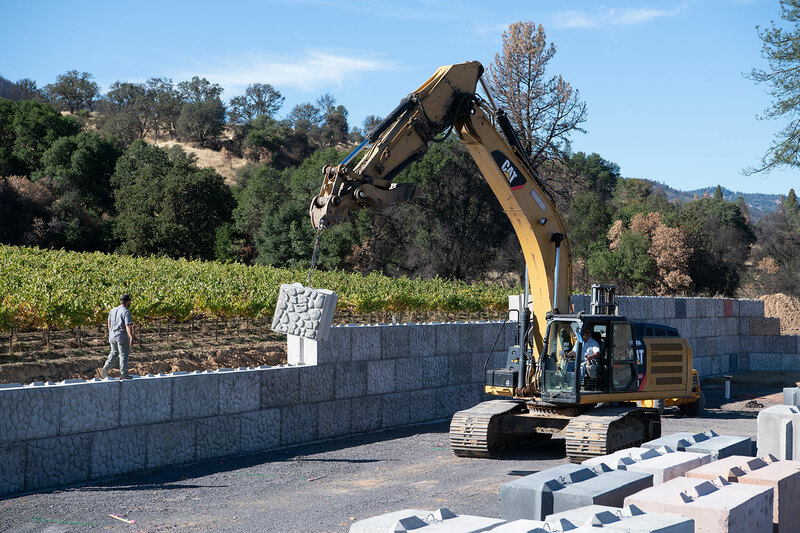 The human-power needed to prune over 300 acres of grapes is vast, and the work spans December to April. This year the gift of a wet winter has slowed things down a little, with several days missed due to intense rains. The abundance of water has been great for the growth of annual cover crops. We use a mix of rye grass, triticale, bell beans and pea shoots (check out the post on foraging greens in the vineyard). The cover crops help hold soil in place through wet winter downpours, the roots provide food and habitat for soil life, flowers provide forage for pollinating insects and the bodies of the plants will return to the soil to continue to feed the soil food web. Each handful of healthy soil can contain billions of vertebrates, invertebrates, fungi and bacteria – the myriad life forms that support all life on earth. Grape vines cannot uptake vital nutrients and water on their own. They depend on these smaller beings to process nutrients and make them bioavailable. This robust yet delicate ecosystem is a universe beneath our feet, and as farmers we feel a duty to protect and enhance it. Our organic practices are a stand against the poisoning of soils, waters, animals and people that is the result of widespread pesticide, fungicide and herbicide use. Chemical agriculture weakens the precious web of life from the ground up. Refusing chemicals on the farm is more labor intensive, and with lush growth after such a wet winter we anticipate needing to work hard to combat mildew and fungus in the canopy of the grape vines. Wire trellis systems throughout the vineyard allow us to pull canes up and away from the fruit to allow more air-flow around developing bunches of grapes. In particularly lush sites we will also need to thin leaves by hand to ensure mildew and mold do not have a chance to set in. A busy season lies ahead! 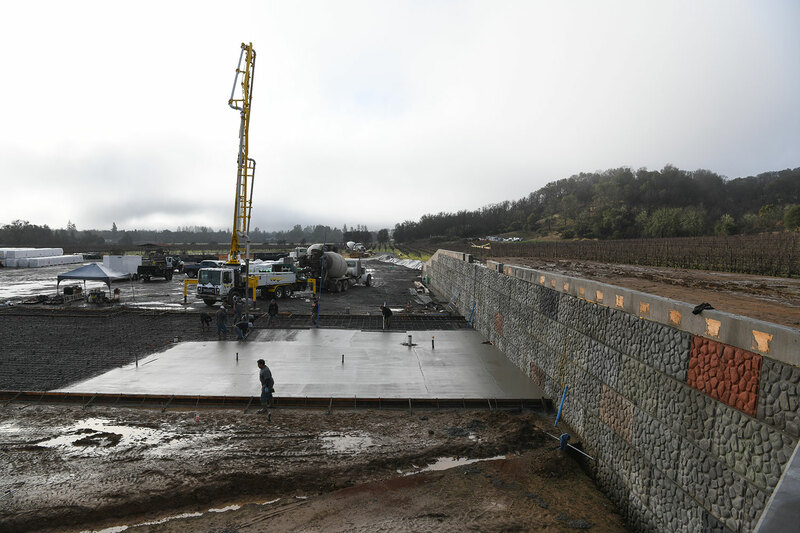 Along with routine vineyard tasks we will be adding 16 new acres of Chardonnay vines at the Road D Ranch. Vines have been ordered and plans for irrigation and layout are underway. As always, we appreciate your support of our endeavors and your choice of organic wine, for the planet, the waters, our children, and your enjoyment. Cheers! 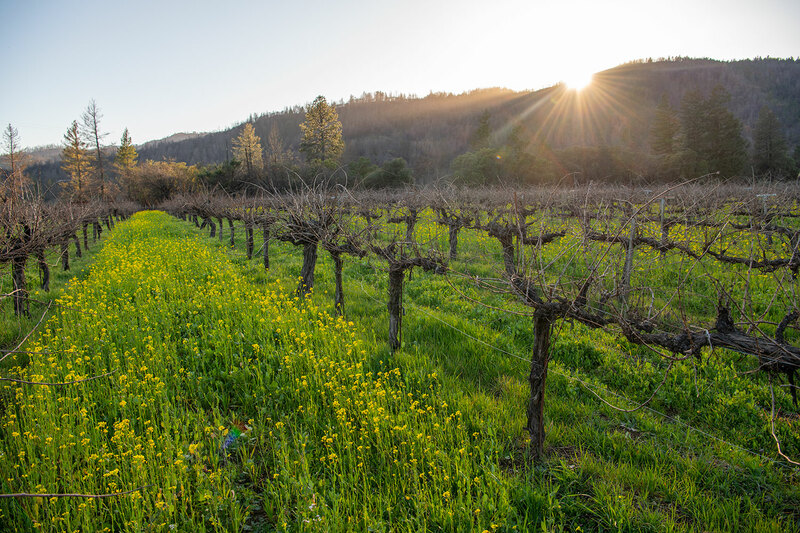 Sunset at Frey Organic Vineyards, Spring 2019. 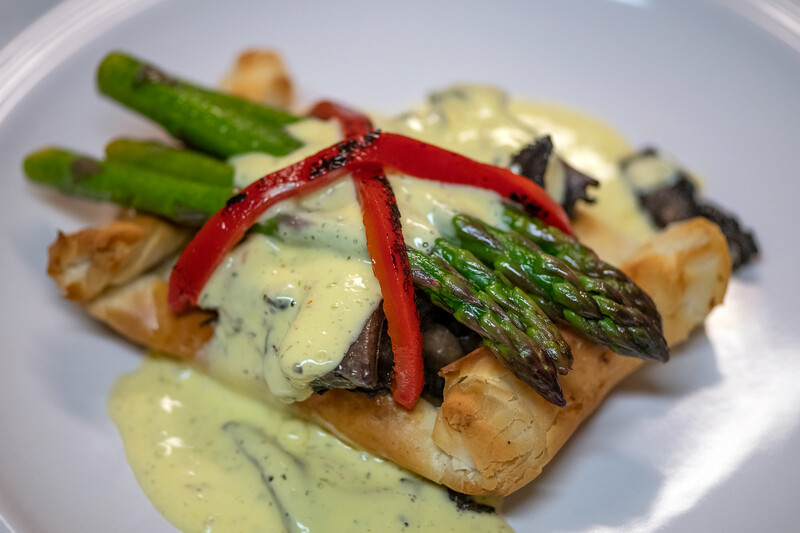 Enjoy lightly braised asparagus and wine-infused Portobello mushrooms in a basket of flaky filo, blanketed with a tarragon hollandaise. The steps are simple and the medley of flavors will wow your guests. We served it with a bottle of Frey Organic Pinot Noir. So good! Filo dough comes frozen, so leave the box in the refrigerator for a day to thaw before gently unrolling the sheets. The sheets I used came in rectangular size of 13 x 18 inches, so after applying the butter and stacking, I cut each in half to 13 x 9 inch rectagles. While working with one sheet, cover the rest with a cloth to prevent from drying out. Melt 1 and a half sticks of unsalted butter in a sauté pan. Start by gently laying out one of the filo sheets and brush on the melted butter with a pastry brush. Take another sheet and put it on top of the buttered sheet. Continue layering the filo sheets this way, with the melted butter in between each sheet until you have 8 layers. If a sheet tears, as it often does, just patch it up with a piece of filo using a dab of melted butter as glue. Melt a pound of unsalted butter in a saucepan on medium to low heat. The melted butter cannot be too hot, nor too cold. Lukewarm is perfect. While the butter’s melting, put the large egg and the large egg yolk in the Cuisinart. Let it run for a minute or so until the mixture becomes light-yellow and creamy, and warmed by the Cuisinart. Then, very slowly, in a thin stream, pour the warm melted butter into the mix while Cuisinart is running. Turn off machine and test for thickness by carefully putting a spoon in the hollandaise. If the spoon comes out coated, without the hollandaise running down the spoon, then consistency is good. Turn on the Cuisinart again and add the juice of half a lemon, one and a half teaspoons of the tarragon, a pinch or two of cayenne and salt. Pulse the Cuisinart and mix, then taste for seasoning. Adjust as needed. You might enjoy more lemon juice or more of a kick with the cayenne. Slice in thin strips and set aside. Best to serve the filo basket, mushrooms and asparagus piping hot, as all three cool quickly. Place a filo basket on a plate. Place two or three spoonfuls of mushrooms in the filo basket. Then 4 or 5 asparagus spears. Partially blanket the mushrooms and asparagus with the warm hollandaise. Lay 2 roasted red pepper strips in an X pattern across it all. 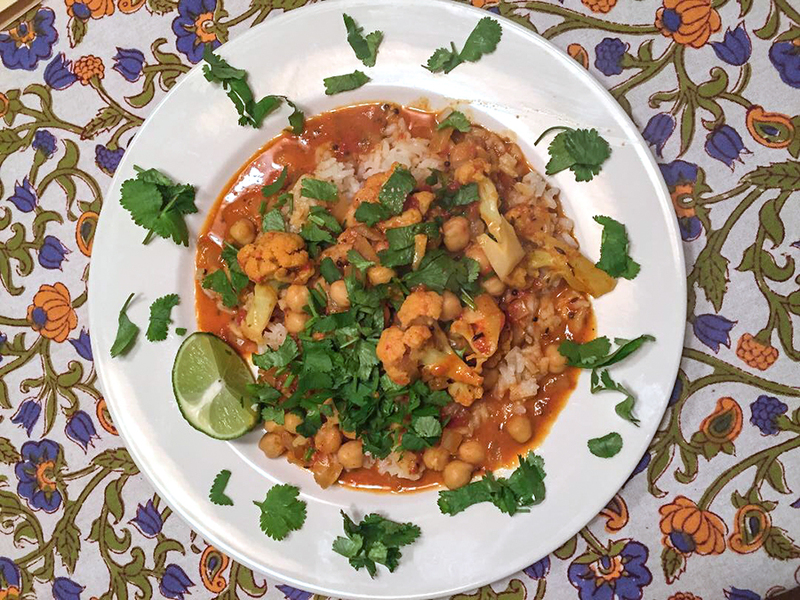 A wonderful recipe from an Organic Wine Club member. Cover a 12 oz. 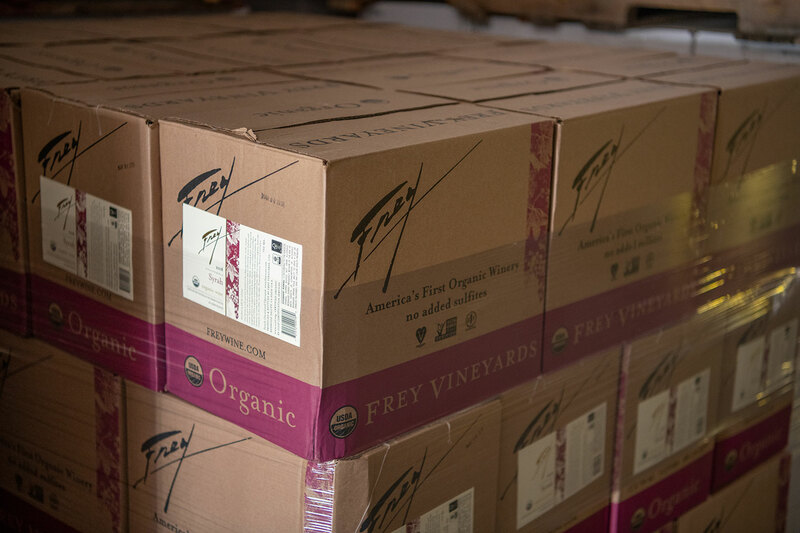 bag of organic fresh cranberries with Frey organic red wine of your choice. Simmer a few minutes, until berries swell. Off heat. Add 1/2 cup chopped candied ginger, 1/2 cup (or less) raw sugar, zest and juice of one lemon. Cover and let sit a few minutes, and enjoy! Perfect for a summer’s evening is this refreshing twist to the classic beverage, white wine peach sangria! Slice 3 ripe peaches. 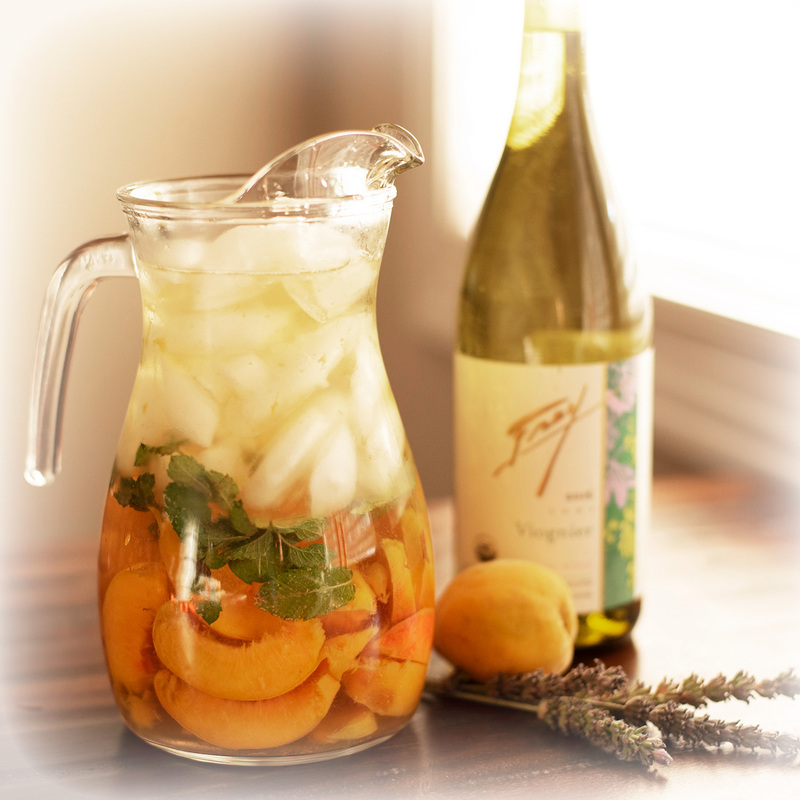 Put peaches, mint, a bottle of Frey organic Viognier and the syrup into a large mason jar or pitcher. (Optional: a splash of St. Germain, ¼ cup or more, to taste.) Refrigerate and marinate for at least 4 hours, or preferably overnight. As the sangria marinates, the peaches may turn a little brown after a few days. This may look unappealing, but the flavor is much improved. If serving to guests we recommend straining out the browned peaches and adding fresh sliced peaches as well as a handful of fresh mint. Serve over ice and enjoy on a warm summer evening!